It’s likely that someone you know has suffered from anxiety or depression. Often, it’s difficult to spot a person with anxiety because they may just seem shy, introverted or simply quieter than others. Anxiety in your tween or teen is one of the most common emotional problems that can cause crippling behavior, sometimes demonstrated by withdrawing from others but also by tantrums, meltdowns, and compulsive actions. Are you noticing your teen or tween worrying more than ever before? Is it social anxiety, an anxiety that causes your child to miss out on birthday parties and school dances? Or, do they have illness anxiety, worried that they will become sick and thinking that every cough and sneeze will turn into the flu? Anxiety may be fueled by different triggers in each child. 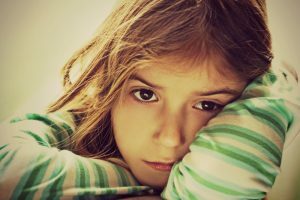 Here is a basic explanation of anxiety and treatments to help your child relate, and live, with this condition. Children with anxiety will also often need reassurance from you about what’s causing the anxiety. Does your child incessantly ask you questions about “whether or not” something will happen? For example, if your child doesn’t like presenting in class, does he/she often go over the assignment repeatedly and then worry that it’s not good enough? And even though the teacher indicated that the material would not be presented out loud in class, is your child certain that it’s going to happen anyway? This constant reassurance is needed to help ease the fear and the worry that’s bubbling within them. Often, if a child has GAD they will also be a bit more rigid and irritable when confronted with a fear. Emotionally, anxiety can be exhausting to the child, often causing physical symptoms as well to include restless behavior, fatigue, upset stomachs and headaches. If you notice that your child is losing weight, lacking sleep and complaining about headaches or stomachaches due to anxiety, it’s time to schedule an appointment with us to discuss options. Unlike adults with anxiety, children don’t usually recognize or understand that it’s their fears causing them such physical stress. The fears children with anxiety feel are typically based on tangible, real life issues. Maybe your child had the stomach flu when younger and now even the thought of throwing up is too much to bear. So, your child has adopted a behavior that includes washing her hands repeatedly, excessively, until they begin to bleed. This compulsive behavior of washing hands frequently stems from her anxiety. There are treatments to consider once your child has been diagnosed with a particular anxiety or general anxiety disorder. GAD is often treated with behavioral therapy by a therapist or counselor. The therapist may provoke anxieties and then teach her ways to manage the worry. Another option, cognitive behavioral therapy, teaches the child to recognize how her thinking may be contributing to her anxiety, helping her comprehend that the anxiety response is out of proportion to what’s triggering it. In some cases, serotonin reuptake inhibitors are recommended or anti-anxiety drugs are prescribed in addition to therapy sessions. When anxiety becomes so profound that it’s interfering with the child’s life, their overall wellness, and affecting the entire family unit, it’s important to seek help. Untreated anxiety tends to worsen over time and can also lead to depression in older children and adults, ultimately causing more issues. If you have more questions about anxiety symptoms and treatments for your child, please give Dr. Shaw or Dr. Kellow a call at 618-235-2311 or visit http://childcarephysicians.com to set up an appointment today.